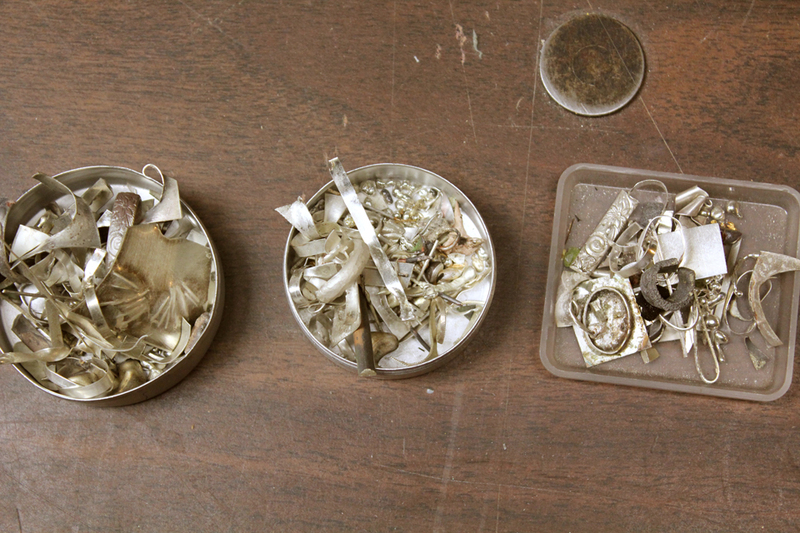 Trying the lost wax method of silversmithing…it’s a long one. So this has been a very interesting experiment in yet another thing I knew absolutely nothing about. I’ll try to describe it to you here although I can only tell you the basics. 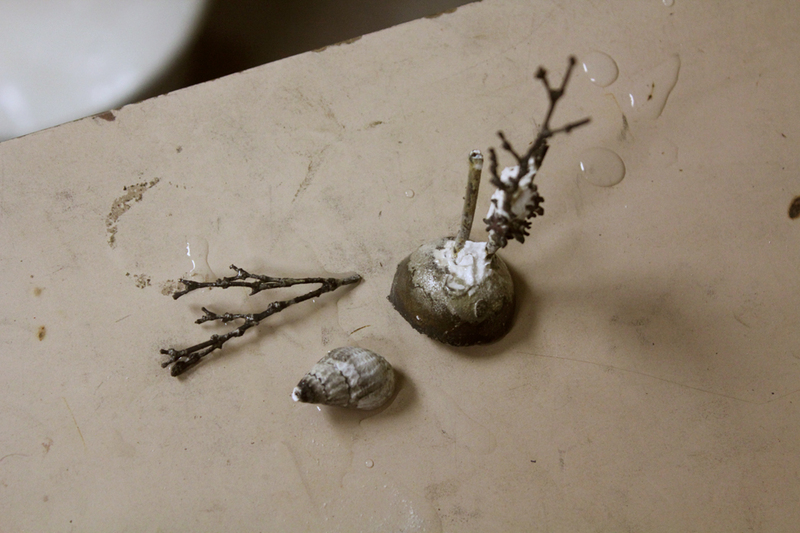 To make a silver cast I used organic matter, two sea shells and a branch, plus a wax ring form, understanding that all of this will be destroyed in the process. 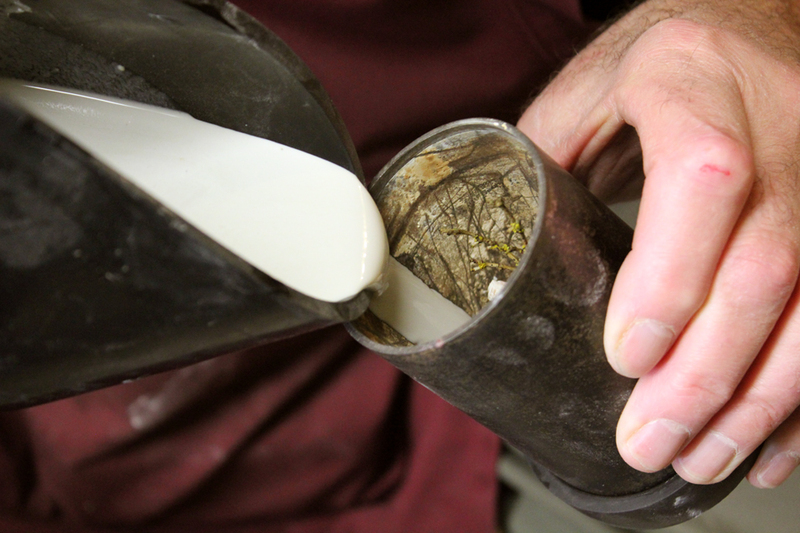 The first step in the process is to fill the bottom of a rubber cup with a bit of wax. 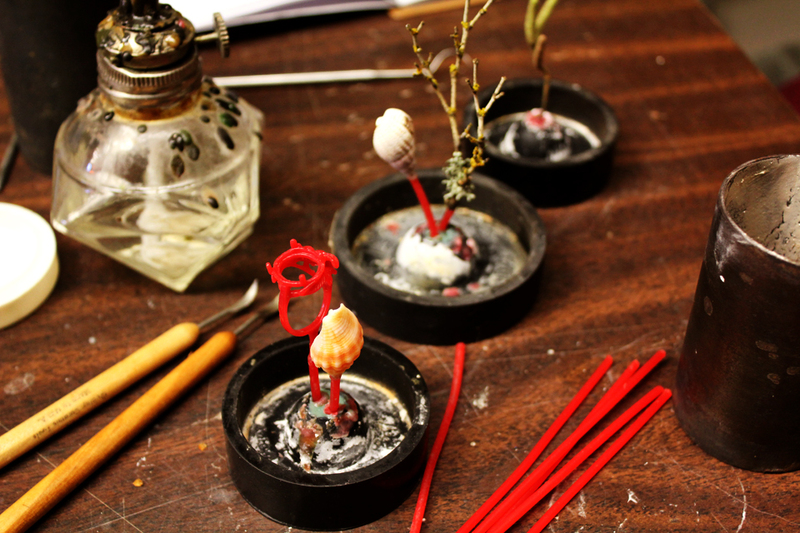 I did this by heating up the little sharp tool and touching the aqua wax buds till they melted. 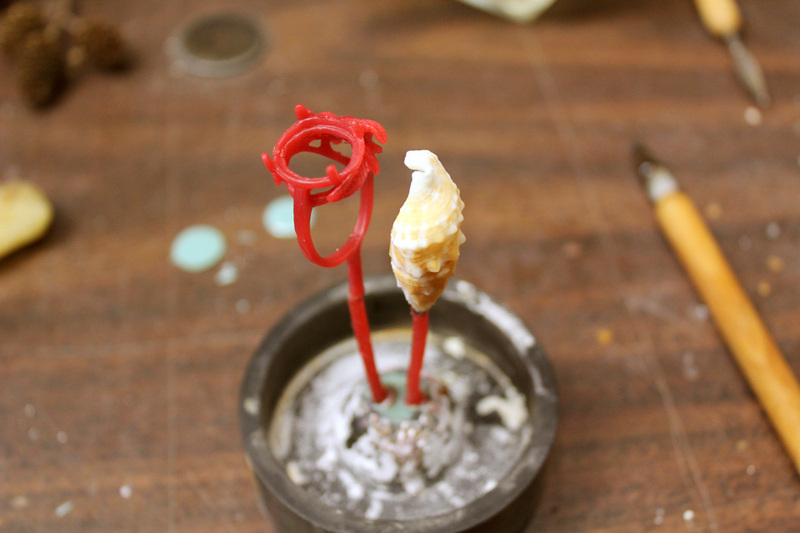 Then the organic pieces are glued to a piece of wax stick with a tiny bit of yellow sticky wax, (peeking out of the upper left hand corner), using the same heated tool. Then they are weighed to determine the quantity of silver needed. 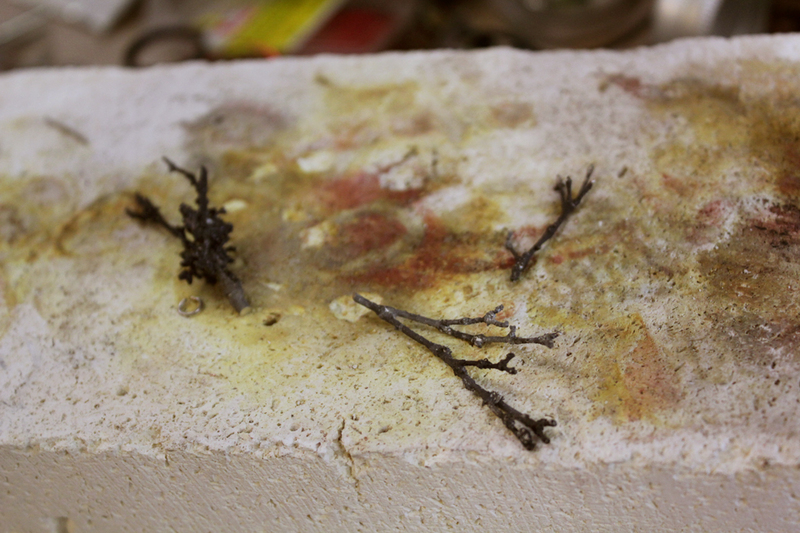 Then a small part of the aqua wax is melted and the organic pieces stood up inside it. 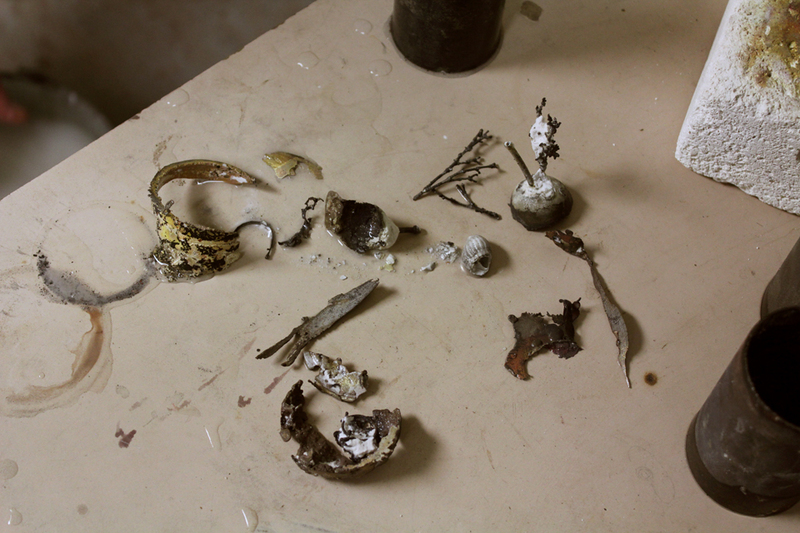 Here you see the organic pieces, the outside metal cylinder and a small lamp for heating the tools in. It’s very important to keep the organic pieces away from the sides and well below the top of the metal cylinder and they mustn’t be touching each other. This is a bit of a juggling act. 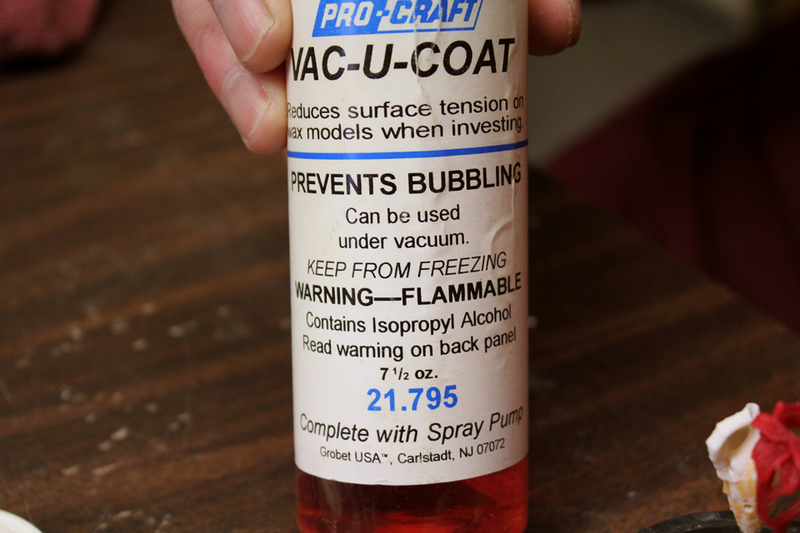 Then the pieces are sprayed with an alcohol coating to prevent bubbles from settling. 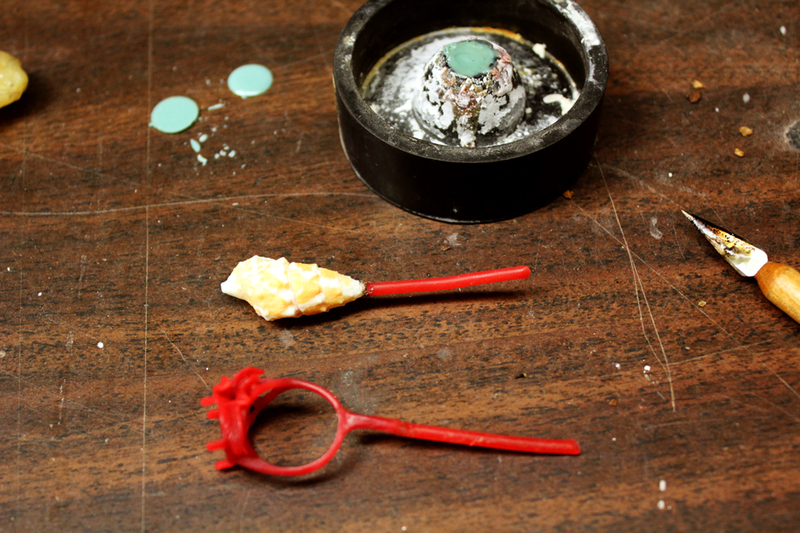 Remember, the trick is to force molten silver into a mould and it’ll go into any bubble spaces. 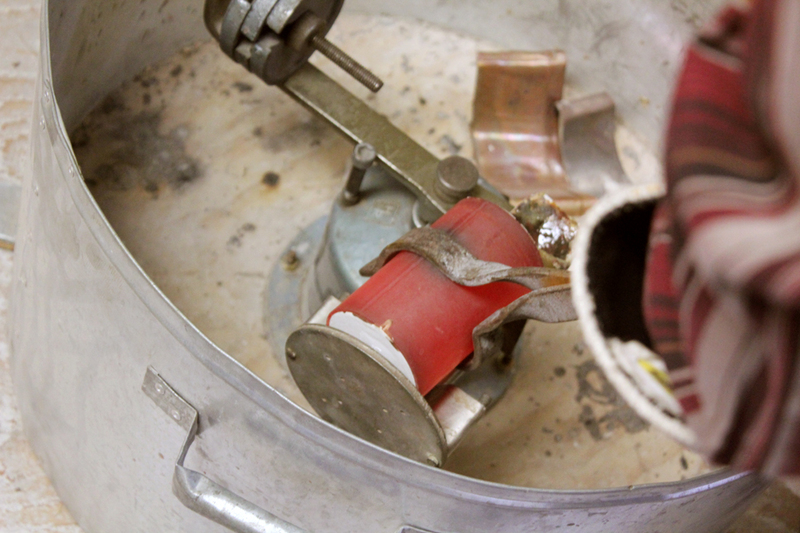 The metal cylinders are fitted into the rubber bowl around the organic bits and wax. 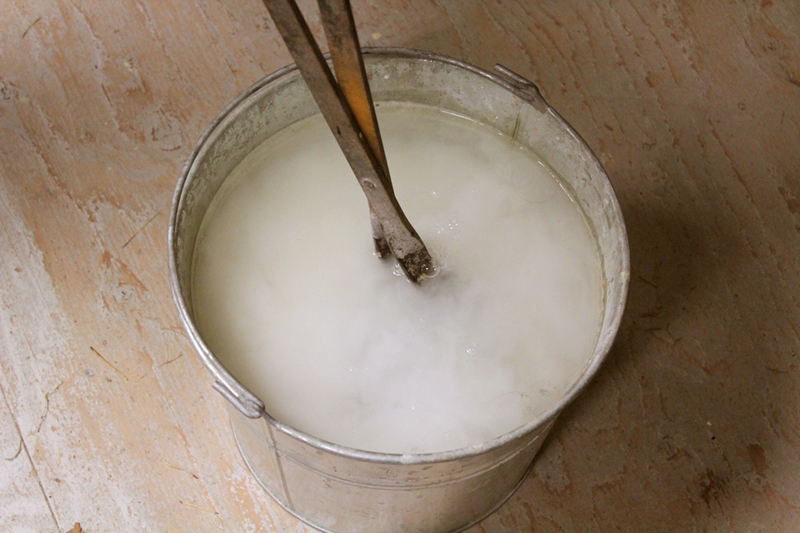 A white powder, called an investment, is mixed with water in a rubber bowl to the thickness of something like pancake batter…remembering to not mix in air and create bubbles, and the mixture is slowly poured down the side of the cylinder. Here Walt is demonstrating. 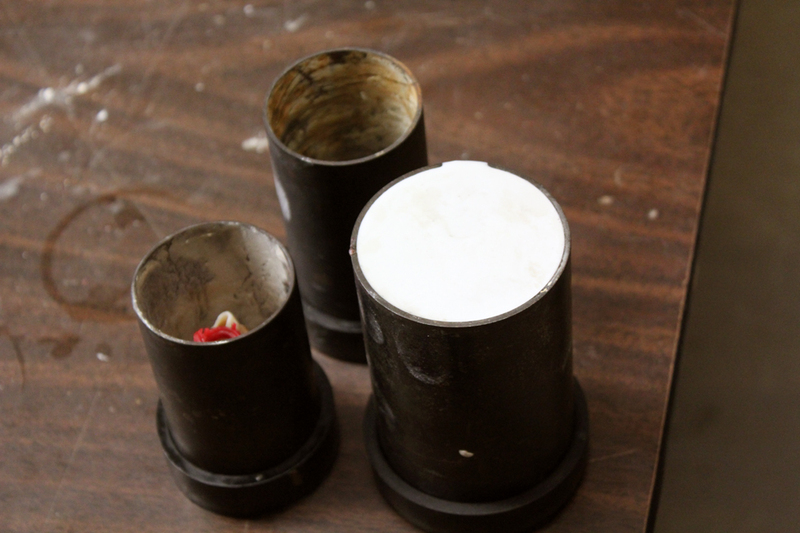 The cylinders are filled to the top, or at least a 1/2 inch over the organic bits and the cylinders are tapped all around to dislodge any air bubbles. And now we wait overnight or so for the investment to harden. This is the machine which will deliver the molten metal into the mould. It winds up clockwise and is held by a pin and, at the right moment, the pin is released and the metal is forced into the mould thru a centrifugal force. 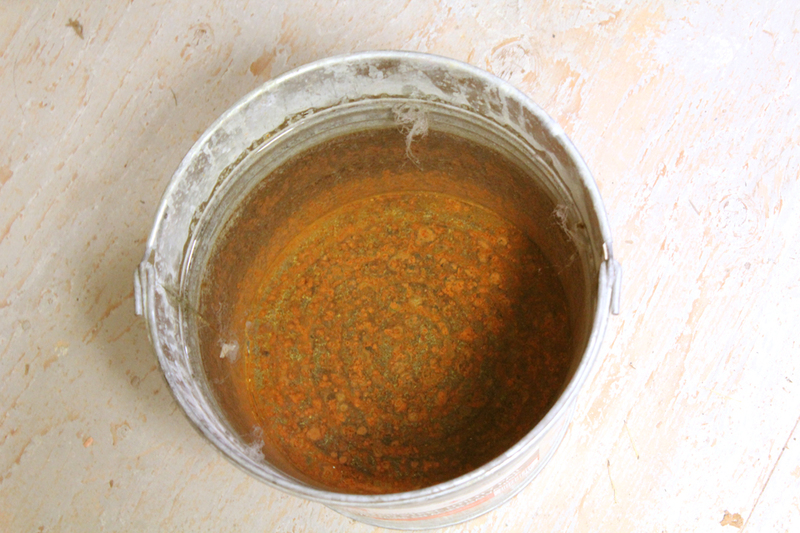 This is the bucket of water for the finished cylinder and for any emergencies. 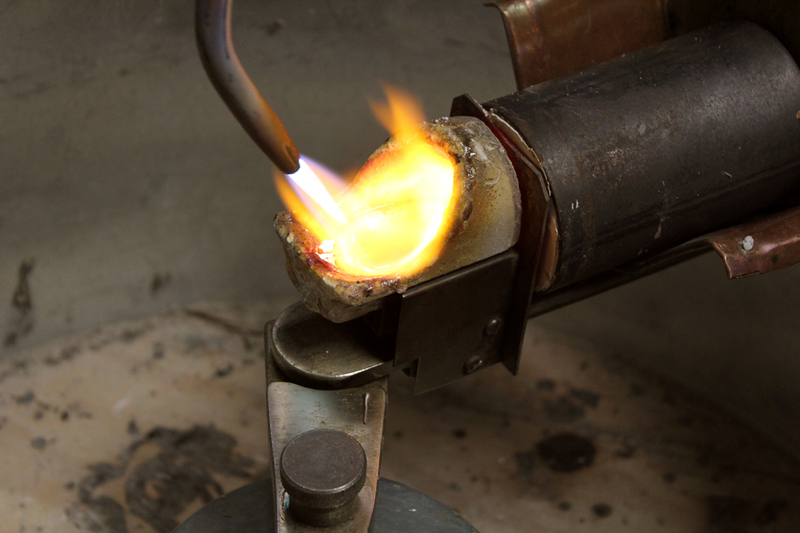 The crucible which will hold the silver is heated to make the melting easier. 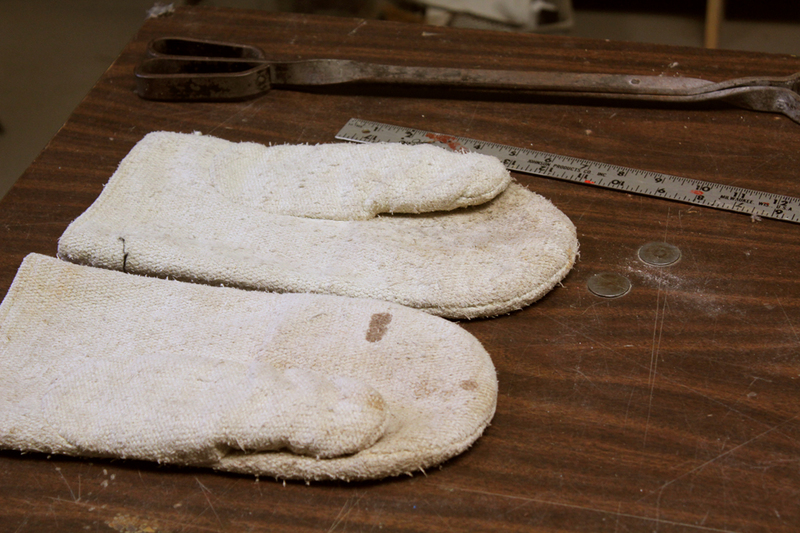 Heat proof tools are at the ready. The metal cylinders, with rubber bottoms removed, have been fired in a kiln to burn and destroy the organic matter leaving a mould. Now they are removed one at a time and placed into the machine. 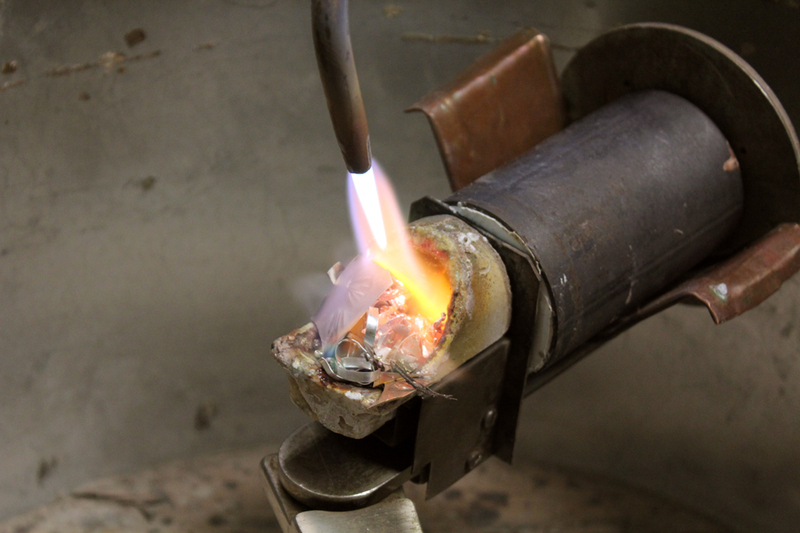 The silver scraps plus some fresh silver nibs are heated till they melt and are a red hot liquid. This is one of the most beautiful sights. Here it is puddling already, I know, not a terrific shot. It’s really hard to get the molten silver to pose for a portrait. 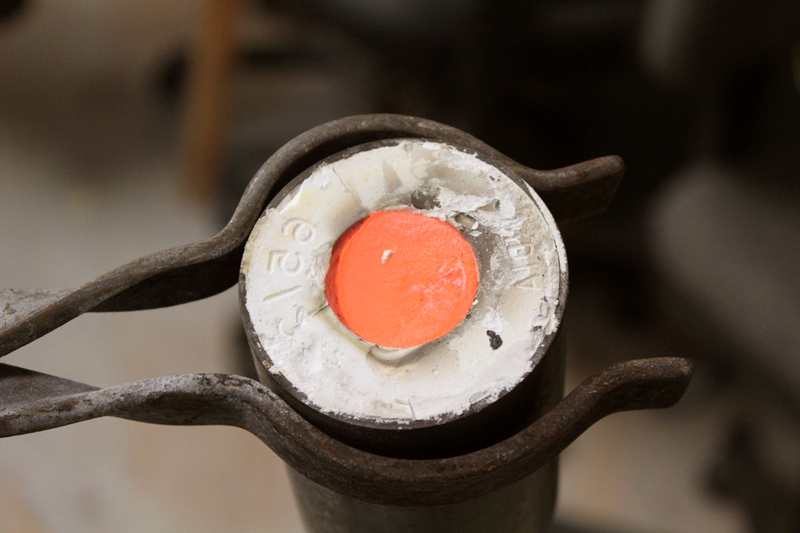 When everything is red hot and glowing, the pin is released and the machine spins the silver into the mould. 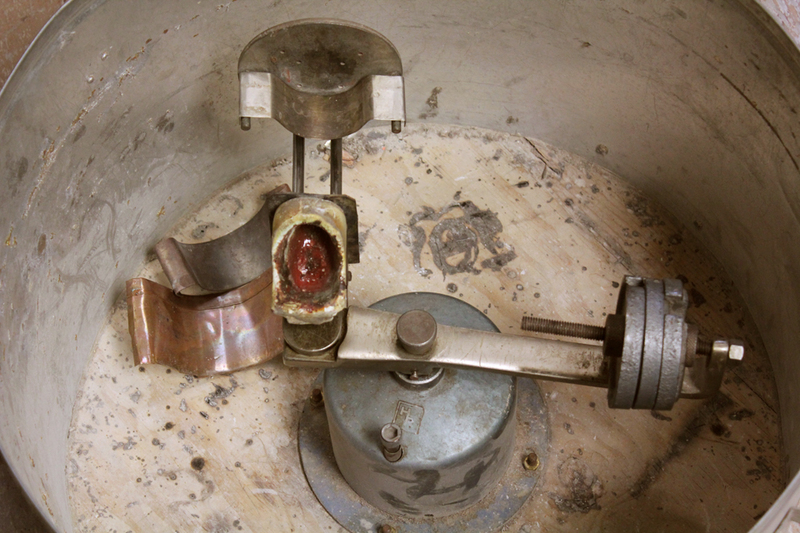 Then the cylinder is removed. Here you can see the molten silver in the space left after the rubber bottom was taken out. 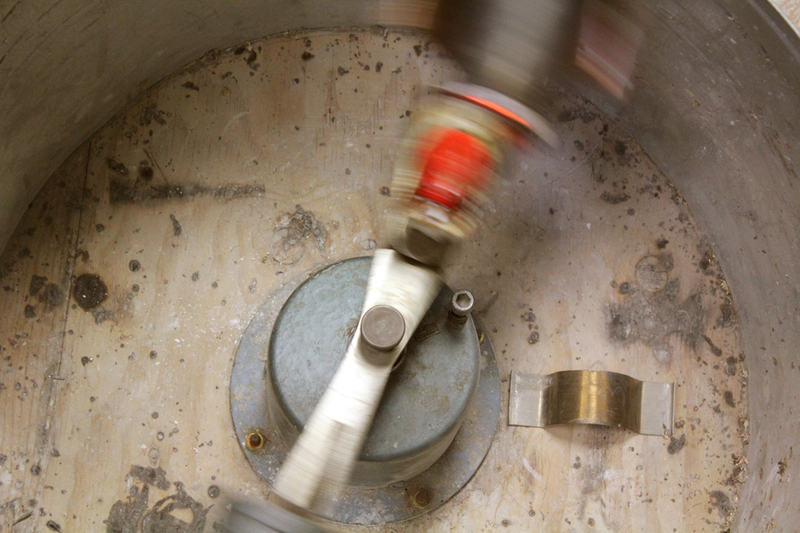 The cylinder is plunged into the bucket where it fizzles and spits and generally does its best Vesuvius impression. 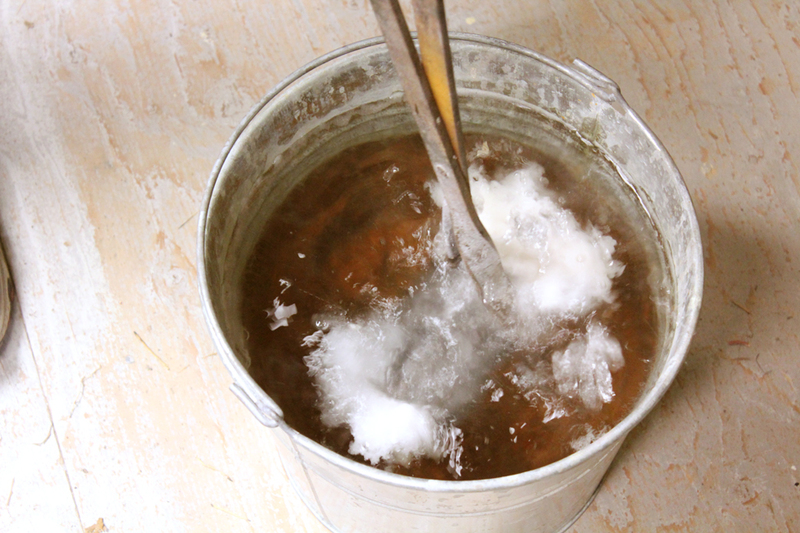 The water turns milky white with the melting investment and the silver pieces are released. Here in the first cylinder you can see my branch…which broke into three pieces…and the shell which failed to break down in the kiln process, and so failed to act as a mould. The process was repeated with the remaining two cylinders with epic fails each time. Oh well, the silver isn’t lost and can easily be reused, and a lesson well learned so all good. 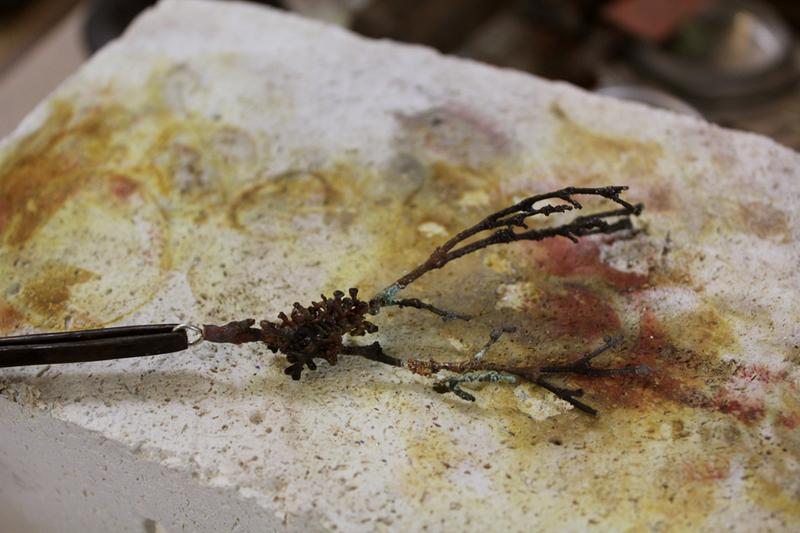 Not willing to give up on my branch, I took it to the jeweller’s desk and placed it on a fire brick. Made a jump ring, fired up the torch and soldered the broken pieces back on, and threw it in the pickle for 20 minutes. Then, three hours later, it was time to go home. So here is a rough silver branch. Unfiled, unpolished, (that’s all to be done still), but I think it’s rather spectacular. 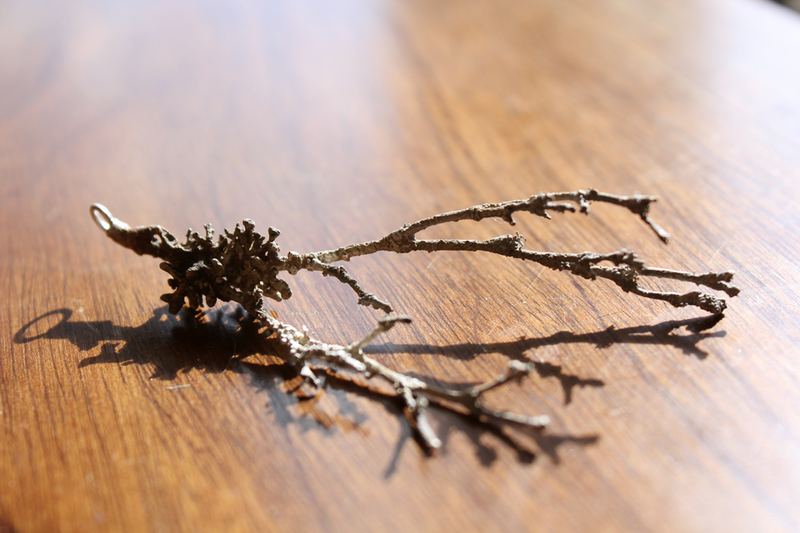 I love how this process made a one-of-a-kind silver branch complete with lichen and moss. I love the delicate simplicity of it, I love that I made this…with Walt’s generous help. I can’t wait to try this again. 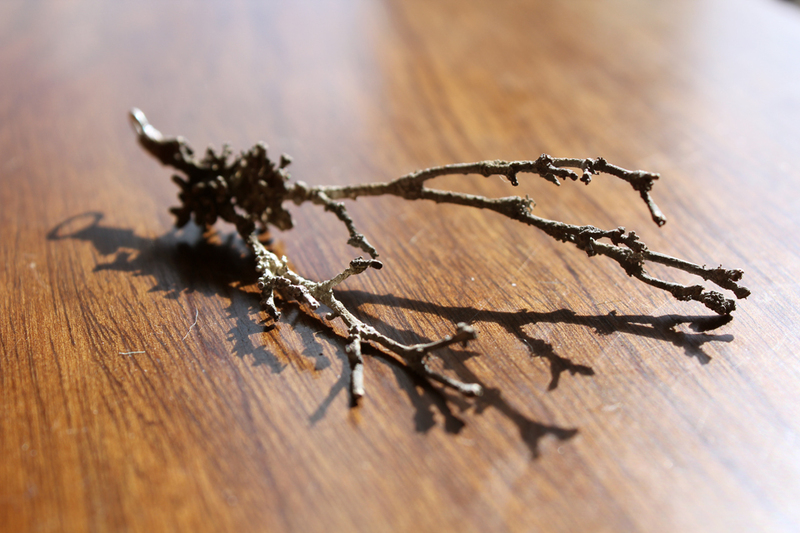 Congratulations on the gorgeous lichen branch – it’s beautiful. Neat. I always thought lost wax was a simple, low-tech, technique. The twig/lichen detail is amazing, elegant. Too bad about the shell. 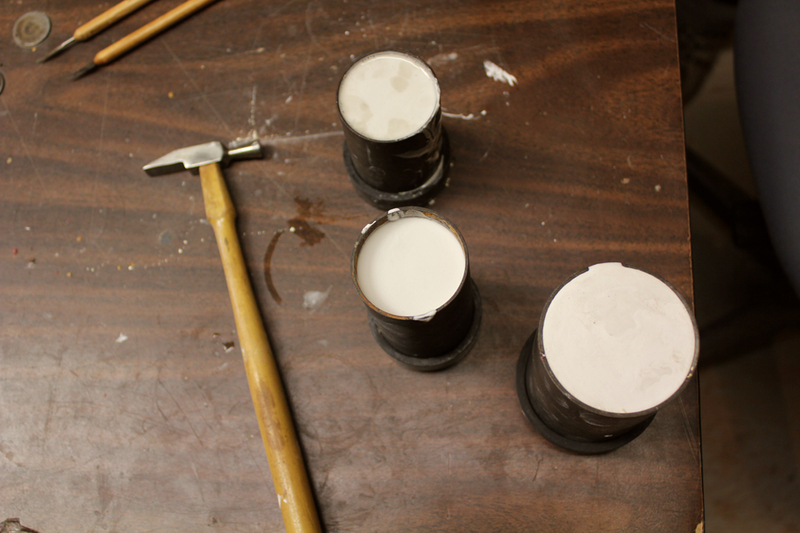 You could do another series of molds, cast a shell in soap or some such, and use that duplicate as your organic. But that sort of defeats the immediacy thing. amazing! thanks for sharing the process. Hi Veronica, what exciting process! Are you jewelry? Oh yeah, I bet it would. 😀 Oh no, now I’ve got too many ideas of what to do with the branch. This is absolutely amazing. What great work…a piece of art and yet so very natural in its beauty!!! I’ve been here for about an hour, in between cooking supper and wrangling small girls to bed. Came over from Julie (MPC), why have I never before? Just read this whole post to my nearly 7 yo, with explanations where necessary, she was fascinated. 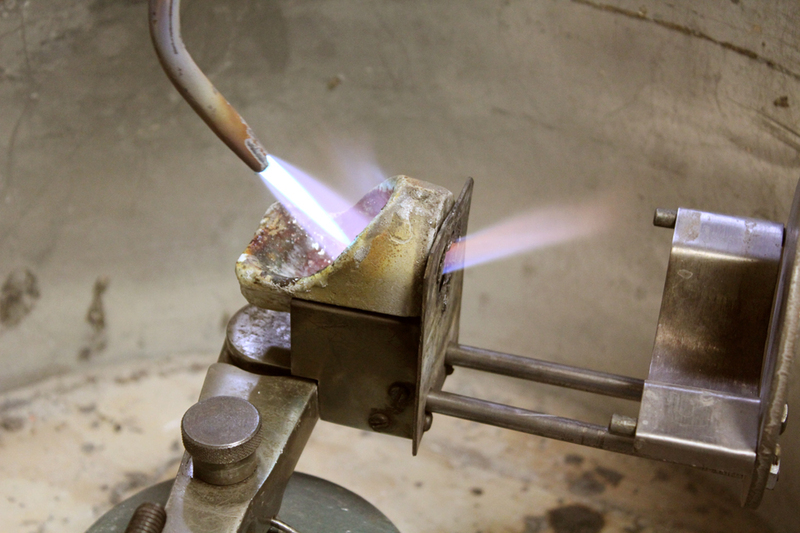 One of my best friends is a jeweler so I’ve witnessed this process before but never tried it, a lovely story with great accompanying photographs. Thank you. Hi Molly, so lovely for me to meet you. 😀 I’m only just figuring this silversmithing thing out, but so far, it’s been great fun. I loved the beach glass ring you made for Chloe! 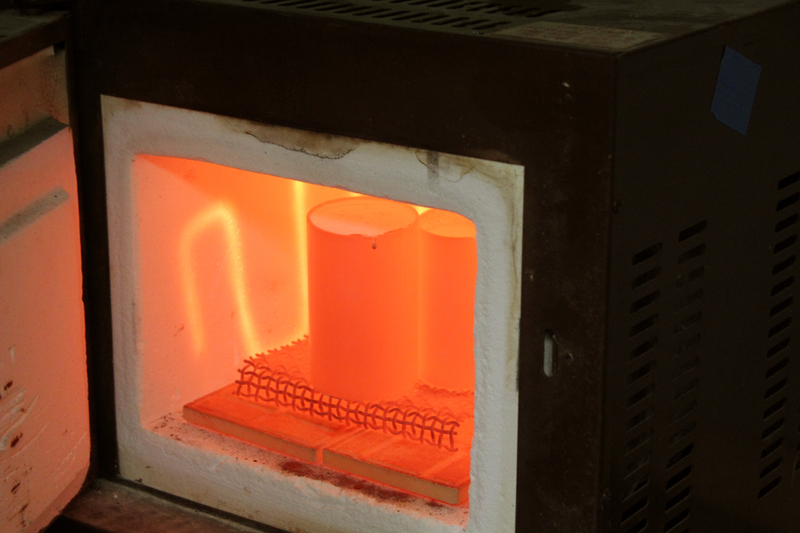 How hot does the kiln need to be when you burn it out? I don’t remember Claire. I think it was an automatic sort of thing. Sorry.